Amanda Kaufman at the SoSTEM event. President Obama’s last State of the Union address on January 12th called for giving everyone a fair shot at opportunity, including offering every student the “hands-on computer science and math classes that make them job-ready on day one.” The United States government, including EPA, is supporting this call by encouraging the next generation of scientists and engineers. There IS hope—and I experienced firsthand that hope with a group of young students at the White House just last week. 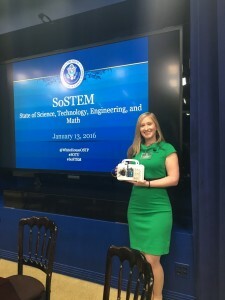 On January 13th, my colleague Joel Creswell and I demonstrated some of EPA’s emerging air sensor technologies research at a post-State of the Union event at the White House called the State of Science, Technology, Engineering, and Math Address (SoSTEM). SoSTEM brought in students from all over—the Bronx, Baltimore, DC, and more—to showcase innovative science and technology to excite the imaginations of the students and encourage them to follow their dreams and passions no matter how insurmountable they may seem. Over 150 students from 5th through 12th grade attended the event. I was lucky enough to spend several hours with these kids while I exhibited a variety of portable, lower-cost citizen science air monitors. They also got to build their own air pollution sensors using LED lights, microprocessors, electrical circuitry, and particulate matter (PM) sensors using kits designed by EPA research engineer Gayle Hagler. These energetic students had lots of questions about the sensors and air pollution in general, and I was amazed by how much they already knew about both topics or just figured out as we played with the various devices. This event also featured presentations by NASA, the Smithsonian National Air and Space Museum, the National Institutes of Health, and some words of wisdom and encouragement from White House Office of Science and Technology Policy Director John Holdren and U.S. Chief Technology Officer Megan Smith, as well as several others. The day ended with a live question-and-answer video chat session with scientists working at the South Pole. The students lined up eagerly to ask questions about what it’s like to live at the South Pole and what kinds of challenges they face in such a harsh environment. Throughout the day, I was constantly impressed by the vision and enthusiasm exhibited by each of the young people, which inspired me to think of what future discoveries they would bring. All this “controlled chaos of enthusiasm” was accompanied by inquiring student reporters making their rounds with thoughtful questions. It was great to see these kids link what they were seeing to school subjects, making the connection between the microprocessors used in the air sensors and those being used in their computer science or robotics classes. About the Author: Amanda Kaufman is an ORISE participant hosted by EPA’s Air, Climate, and Energy national research program.